Comprehensive computer security for MacOS featuring strong two-factor authentication, combining the SecuriKey USB encryption key together with your MacOS login password. Works alone or together with the SecuriKey Encrypted Volume for strong AES-based file & folder encryption. Also compatible with MacOS FileVault2 for full hard drive encryption. Comprehensive computer security for Windows 7, Windows 8 & Windows 10 featuring strong two-factor authentication, combining the SecuriKey USB encryption key together with your Windows password. Works alone or together with EFS or Bitlocker for file & hard drive encryption. 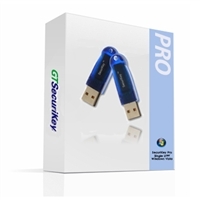 Special two-license SecuriKey Pro edition with support for both Windows 7/8/10 and MacOS. Includes one matching set of 2 SecuriKey USB encryption keys and two software licenses. Can be used on two Windows PCs, two Macs, or one of each.